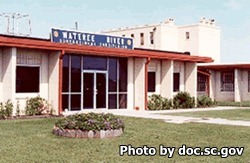 Wateree River Correctional Institution is a medium security level 2 facility that houses 993 youthful male offenders. Inmates can complete phases 1 and 2 of the Youthful Offenders Institution Services program here. Additionally this facility operates a SHOCK program for inmates who have been ordered to it by the court. Offenders at Wateree River Correctional Institution can work on the institutions dairy farm, and beef cattle operation. Additionally, inmates can grow and harvest crops on the farm. Vocational training at Wateree River Correctional Institution includes thoroughbred retirement foundation and construction engineering operations. Offenders can also receive adult basic education courses and prepare for the GED during their incarceration. Wateree River Correctional Institution offers religious worship services, twelve step programs, and medical/dental care for all inmates. Visits at Wateree River Correctional Institution are based on the first letter of the inmate's last name and are rotated weekly, you will need to contact the facility to verify the visiting hours and to find out the current rotation. Visiting occurs on Fridays from 3pm-6pm and on Saturdays and Sundays from 8am-12pm and 1pm-5pm.